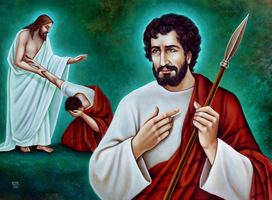 Saint Thomas was one of the fisherman on the Lake of Galilee whom Our Lord called to be His Apostles. By nature slow to believe, too apt to see difficulties and to look at the dark side of things, he had nonetheless a very sympathetic, loving, and courageous heart. When Jesus spoke to His apostles of His forthcoming departure, and told His faithful disciples that they already knew the Way to follow Him, Saint Thomas, in his simplicity, asked: Lord, we know not whither Thou goest, and how can we know the way? When the Master during a journey turned back to go toward Bethany, near Jerusalem, to the grave of Lazarus, the apostle Thomas, knowing of the malevolent intentions of the Jerusalem religious authorities, at once feared the worst for his beloved Lord. Yet he cried out bravely: Let us go then and die with Him! After the Resurrection his doubts prevailed, and while the wounds of the crucifixion remained vividly imprinted in his affectionate memory, he could not credit the report that Christ had risen. But at the actual sight of the pierced hands and side, and the gentle rebuke of his Saviour, his unbelief vanished forever. His faith and ours have always triumphed in his joyous utterance: My Lord and my God! That Saint Thomas, after the dispersion of the Apostles, went to India, where he labored and died at Meliapour, is a certain fact of history. The Roman Breviary states that he preached in Ethiopia and Abyssinia, as well as in Persia and Media. Surely his was a remarkable history, reserved for the inhabitants of Christ’s glory to see in its fullness some day. Before he died in Meliapour, he erected a very large cross and predicted to the people that when the sea would advance to the very foot of that cross, God would send them, from a far-distant land, white men who would preach to them the same doctrine he had taught them. This prophecy was verified when the Portuguese arrived in the region, and found that the ocean had advanced so far as to be truly at the foot of the cross. At the foot of this cross was a rock where Saint Thomas, while praying fervently, suffered his martyrdom by a blow from the lance of a pagan priest. This happened, according to the Roman Breviary, at Calamine, which is in fact Meliapour, for in the language of the people the word Calurmine means on the rock (mina). The name was given the site in memory of the Apostle’s martyrdom. Reflection: Cast away all disquieting doubts, and learn to triumph over outlived weaknesses as Saint Thomas did, who by his ignorance has instructed the ignorant, and by his incredulity has served the faith of all ages. You were a disciple of Christ, and a member of the divine college of Apostles. Having been weak in faith you doubted the Resurrection of Christ, but by feeling the wounds you believed in His Passion: pray now to Him, O glorious Saint Thomas, to grant us peace and great mercy. Everlasting God, who strengthened Your Apostle Thomas with firm and certain faith in Your Son’s Resurrection, grant us so perfectly and without doubt to believe in Jesus Christ, our Lord and our God, that our faith may never be found wanting in Your sight; through Him who lives and reigns with You and the Holy Spirit, one God, now and forever. Amen.